I know, I know. There are days I can barely eek out a blog and today, I'm overrun with thoughts and ideas. Never fear, I'll just post away in the hopes of appeasing the blog gods as by bloggeth run amok. And did you know that September 19 is like, really Talk Like a Pirate Day? That it's official and everything? It's true. I think it's been sanctioned and annointed as such. Anyway, these guys say so, so it must be true, eh? 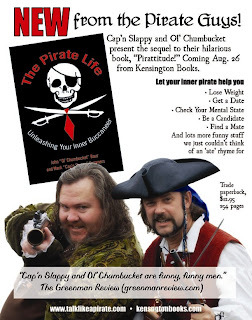 You can visit them at www.talklikeapirate.com. Looks like they've even written a book! Wow. Then there is that other thing that is happening today. At least here in Louisville. It's a little thing called The Ryder Cup. A little thing that is not so little. And all for a little ball that goes sailing through the air only to land expertly in a cup in the ground. This Ryder Cup thing is all the rage here right now, since it's being played out at a golf course down the road. Just a little ol' competition between the Euros and the USofA. So, what happens when golf comes to town on the country road that I drive each morning on my way to work? And I'm late for work. But at least today I'm driving to work rather than flying. Which brings me to this. Wrong. This is not a friendly hairdryer. This hairdryer causes hand cramps like you would not believe. Who in their right mind would design a hair dryer in which you have to grip the handle AND hold down the button to keep the thing on, all in one grip? That's right, girls, you have to grip and hold and style and fluff and not take your thumb off that button. Without getting a cramp. For a woman with long hair and small hands, it is a nightmare. 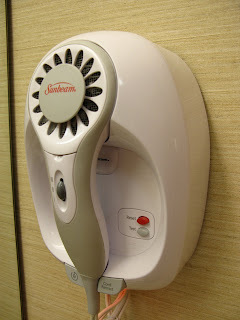 I can only say that this hairdryer--which is now my new pet peeve--had to be designed by a... (yes, you know what I'm going to say, girls) a man. No doubt about it. p.s. Tell your friends and neighbors. If you come by and comment today before midnight PST on this blog, you might win one of the 5 ebook copies of The Curse or The Cult I'm giving away tonight. So go! Tell everyone now! Yes talk like a Pirate day. My husband always gets a kick out of it. Oh yes also traffic for an athletic event is bad. Sometimes its hard to miss. It's best to avoid it. As for the hairdryers, that's why I never dry mine. hehehehe and it's fitting that you are giving the books away today. I have already read The Curse. It was good I can't wait to read the rest. Hi Maddie. Glad you are back home again, even if you do have to deal with the traffic. Hope it eases up soon. Woohoo Karen! Maybe there is a copy of The Cult laying around with your name on it. :) thanks for stopping by. I'm so glad you liked The Curse. Renee, yes, I have been most fortunate this week. My power only winked a couple of times on Sunday and I had electricity all week. I know there are others much less fortunate. Our friend Jan still is without power! I will say that my Internet was out for several days but I was still able to stifle my email fix with cell phone and the office computer. I really feel for those of you who have been burping (or less!) for the past week. I read about Pirate's Day in one of the blogs and it was really interesting. I had fun trying to think up a pirate's name for one of the games! You hit the spot about the hairdryer. Most things for the home are designed by men but used by women. I was looking to buy a new house a few years ago and the designs left me baffled. In one house the refrigerator was behind the kitchen door - to open the refrigerator you had to first close the kitchen door. Crazy. Ha, ha, Maddie! I loved the picture of the jam and the golfers blocking traffic. I'm too late for your contest thing-for some reason didn't get the email until this morning, but I like the new blog look. We've got Pogue Landing going on here. I have to figure out how to be in two places at once before 1 p.m. today. Pollyana and Angietheresa... Sigh, yeah, those pirates. They always get to me! Maybe it's the era, the ships, the freedom, the so darned bad boy image. I dunno. I bet if we lived back there, though, we'd think the scoundrels were nasty, dirty creatures we wouldn't touch with a ten foot pole! But in our minds, yes...there is such a appeal. Tatiana, you're so right. Kitchens are the worst if some thought isn't put into it. There is an art to designing such things! Jennifer, what is Pogue Landing? Have fun!